Photo by Jordan Elton. Members of the Student Environmental Alliance staffed a booth in the Atrium Feb. 4–8, 2013 where students could stop to sign a pledge to stop purchasing Cobber Water, the 99 cent bottled water sold on campus. Student Environmental Alliance is trying to promote a social change in the Concordia community. Eliminating Cobber Water from campus is SEA’s first goal in moving toward a more sustainable campus. 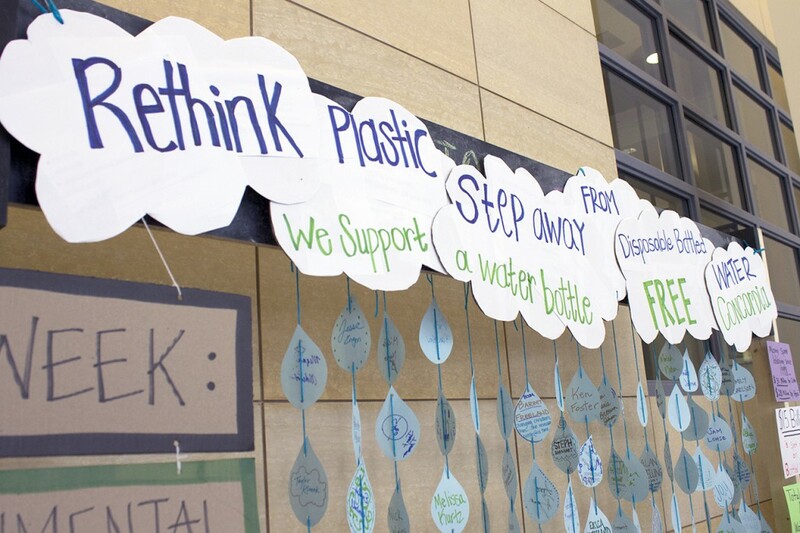 SEA, Student Government Association and Campus Democrats are working together to inform the student body about how they can take action to get rid of the plastic water bottles. “If the demand goes down, there’s no need for (the bottles),” said Kristina Kaupa, Concordia junior and co-president of SEA. Kaupa said the first step for students, staff and faculty is to help promote a change campus culture. From Feb. 4 to Feb. 8, the three organizations worked at a table in the atrium where people could learn about Cobber Water and the work being done to eliminate it. Students had the option to sign a pledge to not buy Cobber Water, which will be used to help the organizations write a proposal to urge Concordia to get rid of the bottles. Also at the tables, people could also write on a raindrop, which was then hung from a sign. The drops served as visual reminders that the community is engaged in the efforts being made. Jason Giffey, Dining Services retail operations manager, said Cobber Water is purchased locally, through the Minnesotan company Water Billboards. The initial cost of the water is less, which allows them to sell it at a lower cost to students. While Dining Services has a contract that commits them to selling the bottles through the rest of this year, there is no commitment for next year yet, Giffey said. He also said that if the Concordia culture changes and shifts their need from the plastic bottles, they will not be purchased. Randy Kamrath, co-owner of Water Billboards, agrees. Kamrath and his wife Susan, who operate the company, share the same sustainable mindset Concordia is trying to attain. They are familiar with the mission of the college, as Susan and their daughter are both Concordia graduates. One of the main reasons the Kamraths began the company was to sell compostable water bottles so the waste from the bottles avoids landfill, Kamrath said. “We are a little ahead of our time,” Kamrath said, referring to the compostable bottles. Unfortunately, he said, they have had to switch back to the petroleum-based bottles for now. The compostable bottles needed to be disposed of properly, because they cannot be mixed in the normal recycling, Kamrath said. While the current Cobber Water bottles may not be compostable, Kamrath said the bottles they now sell are made with recycled plastic. Those who use the bottles though, need to make sure they are put into the recycling. “We don’t want stuff put into the landfills,” Kamrath said. As a company that strives for sustainability, Kamrath said in order to reduce reliance on plastic bottles, the pressure needs to come from the consumers. The consumers are the ones who want the products, so they need to ask for the sustainable products to be available. The organizations are drafting a proposal to bring before the water works and sustainability council. The proposal will emphasize the elimination of Cobber Water, as well as adding more water bottle filling stations across campus.